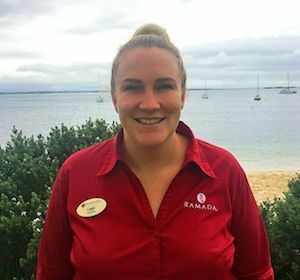 Wyndham Vacation Resorts Asia Pacific has announced that Leah Besant has been given responsibility for overseeing the operations at Ramada Resort Shoal Bay. Besant has been promoted to the position of executive assistant manager after two years at the resort, giving her responsibility for day-to-day operations. She reports to Nathan Hunt, regional director of Operations – NSW, TAS, WA and NZ. Besant joined Ramada Shoal Bay in November 2015 as a guest services agent and has been promoted into a variety of roles since, including administration assistant and front office team leader. Matt Taplin, senior vice president Hotel and Resort Operations & Property Development, said Besant’s extensive customer service experience and commitment to Wyndham’s signature Count On Me! service made her an asset to the team. “Leah is a very popular team member and I am confident she will excel in this role while continuing to build strong relationships with our guests and stakeholders,” he said. Located just 30 minutes from Newcastle Airport, Ramada Shoal Bay is an ideal base for exploring the beautiful Port Stephens region. The resort offers three restaurants, a fitness centre with indoor pool and gym, an outdoor lagoon-style pool and conference facilities suitable for up to 300 delegates.